Star Trek: Insurrection by JM Dillard, Sci Fi. Book is in good condition, all pages intact. 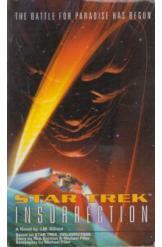 A novelization of the movie "Star Trek: Insurrection." Captain Picard and the crew of the Enterprise defy Starfleet Command when they are ordered to assist in the displacement of a peaceful alien society.